Description: New Acer laptop silver upper case palmrest and keyboard. 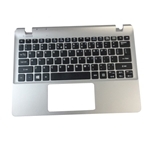 This part does not include the touchpad. Acer Aspire E3-112, E3-112M, V3-112, V3-112P.